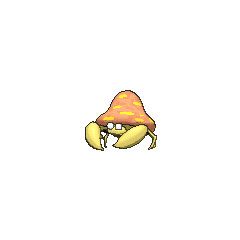 Parasect in game: 377 Who? Important notice! Pokemon Parasect is a fictional character of humans. Parasect is an orange, insectoid Pokémon that has been completely overtaken by the parasitic mushroom on its back. 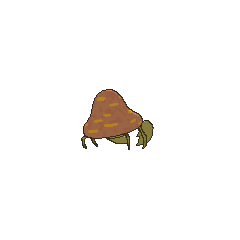 It has a small head with pure white eyes and a segmented body that is mostly hidden by the mushroom. It has three pairs of legs, with the foremost pair forming large pincers. The fungus growing on its back has a large red cap with yellow spots throughout. The insect has been drained of nutrients and is now under the control of the fully-grown tochukaso. Parasect can thrive in dank forests with a suitable amount of humidity for growing fungi. Swarms of this Pokémon have been known to infest trees. The swarm will drain the tree of nutrients until it dies, and will then move on to a new tree. Its former signature move is Spore. Parasect first featured in The Problem with Paras under the ownership of Cassandra as a very weak Paras. Cassandra needed it to evolve into a Parasect so she can use the giant mushroom to aid in her medical research. After it battled with Ash's Pokémon (albeit, all of them except his disobedient Charmeleon not trying at all), and a battle with Team Rocket, Paras evolved. 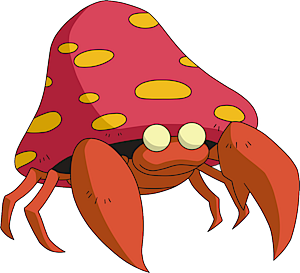 Several Parasect appeared in For Ho-Oh the Bells Toll!, where they protected the Tin Tower after Team Rocket stole the crystal bells on the top floor. In Hocus Pokémon, Lily needed Stun Spore from a Parasect to complete a spell. Officer Jenny uses a Parasect in Gulpin it Down. A Parasect appeared in Princess vs. Princess competing in the Queen of the Princess Festival contest. Multiple Parasect were among the Pokémon seen at Professor Oak's Laboratory in Showdown at the Po-ké Corral. Parasect also appeared in The Power of One. 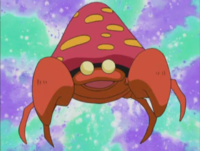 A Parasect was seen in a fantasy in The Rivalry Revival. Multiple Parasect also appeared in Celebi: Voice of the Forest and Destiny Deoxys. A Parasect was one of the Pokémon seen at Wings Alexander's barn in Throwing in the Noctowl. 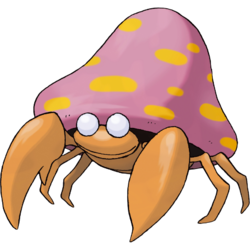 A Parasect was one of the Pokémon seen at Professor Oak's Laboratory in Showdown at the Oak Corral. A Parasect appeared in the opening of Lucario and the Mystery of Mew. 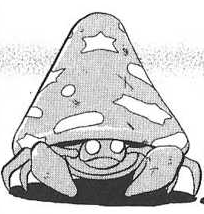 A Parasect also appeared in Genesect and the Legend Awakened at Pokémon Hills. A Trainer's Parasect appeared in Alola to New Adventure!. A Trainer's Parasect appeared in SM004. 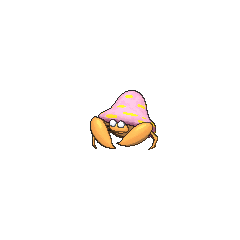 A Parasect appeared in SM008. EP044 Parasect Ash's Pokédex Parasect, the Mushroom Pokémon. It battles using poison spears that spread from the mushroom canopy on its back. Parasect debuts in Long Live the Nidoking! where it is scene as one of the Pokémon at Fuchsia City's Safari Zone and in the next round A Hollow Victreebel where multiple Parasect were captured by red off-screen. In the Gold, Silver & Crystal chapter of Pokémon Adventures, Crystal uses a Parasect nicknamed Parasee which it first appeared in Slugging It Out With Slugma, extensively in her Pokémon capturing, using its Spore attack to put targets to sleep. Her Parasect is seen to be capable of increasing the radius of its Spore attack to at least 3 kilometers. In Lively Larvitar, the origin of Crystal's Parasect is revealed: it, along with Crystal's Natu, Hitmonchan, and Cubone, were wild Pokémon living in Mt. Mortar and had fought with a local Arcanine that had gone berserk from a severe eye injury. Parasect was able to create medicinal spores to help Arcanine heal and Crystal recover from her fractured arms. In Lugia and Ho-Oh on the Loose (Part 1), Crystal reveals yet another ability of Parasect: it is able to use the powder attacks it possesses to combine into a wider range of spores, including one for corroding metals. Another Parasect appeared in The Last Battle XIII as one of the Pokémon sent to help the fight in Ilex Forest. Paras and Parasect are the only Pokémon in the game to take more than 4 times as much damage from any one type of attack under normal battle conditions: a Paras or Parasect with the Ability Dry Skin takes 5× damage from Fire-type attacks.